aA single respondent with severe sepsis might contribute a hospitalization to the survivor cohort in one hospitalization but be lost to follow-up after a future hospitalization. The categorizations of hospitalizations as included vs excluded are mutually exclusive, but the categorizations of respondents are not. Comparisons were all first hospitalizations. Error bars indicate 95% confidence intervals (CIs); IQR, interquartile range. Interpretive Example: Compared with stable rates before severe sepsis, the prevalence of moderate to severe cognitive impairment increased from 6.1% (95% CI, 4.2%-8.0%) before severe sepsis to 16.7% (95% CI, 13.8%-19.7%) at the first survey after severe sepsis (P < .001 by χ2 test; Table 2). The unadjusted mean number of functional limitations of surviving cohort members is shown. Error bars indicate 95% confidence intervals. Interpretive Example: Groups that had no functional or mild to moderate limitations before sepsis had a stable trajectory before sepsis but developed about 2 new limitations after sepsis. But patients with severe limitations at baseline had a modest increase from a baseline of 6.99 to 7.98 at their first survey after sepsis (Table 3). Interpretive Example: No single activity of daily living (ADL) or instrumental ADL accounted for the worsened functional status among survivors of severe sepsis. Instead, there was a wide range of new difficulties across the array of activities. Context Cognitive impairment and functional disability are major determinants of caregiving needs and societal health care costs. Although the incidence of severe sepsis is high and increasing, the magnitude of patients' long-term cognitive and functional limitations after sepsis is unknown. Objective To determine the change in cognitive impairment and physical functioning among patients who survive severe sepsis, controlling for their presepsis functioning. Design, Setting, and Patients A prospective cohort involving 1194 patients with 1520 hospitalizations for severe sepsis drawn from the Health and Retirement Study, a nationally representative survey of US residents (1998-2006). A total of 9223 respondents had a baseline cognitive and functional assessment and had linked Medicare claims; 516 survived severe sepsis and 4517 survived a nonsepsis hospitalization to at least 1 follow-up survey and are included in the analysis. Main Outcome Measures Personal interviews were conducted with respondents or proxies using validated surveys to assess the presence of cognitive impairment and to determine the number of activities of daily living (ADLs) and instrumental ADLs (IADLs) for which patients needed assistance. Results Survivors' mean age at hospitalization was 76.9 years. The prevalence of moderate to severe cognitive impairment increased 10.6 percentage points among patients who survived severe sepsis, an odds ratio (OR) of 3.34 (95% confidence interval [CI], 1.53-7.25) in multivariable regression. Likewise, a high rate of new functional limitations was seen following sepsis: in those with no limits before sepsis, a mean 1.57 new limitations (95% CI, 0.99-2.15); and for those with mild to moderate limitations before sepsis, a mean of 1.50 new limitations (95% CI, 0.87-2.12). In contrast, nonsepsis general hospitalizations were associated with no change in moderate to severe cognitive impairment (OR, 1.15; 95% CI, 0.80-1.67; P for difference vs sepsis = .01) and with the development of fewer new limitations (mean among those with no limits before hospitalization, 0.48; 95% CI, 0.39-0.57; P for difference vs sepsis <.001 and mean among those with mild to moderate limits, 0.43; 95% CI, 0.23-0.63; P for difference = .001). The declines in cognitive and physical function persisted for at least 8 years. Conclusions Severe sepsis in this older population was independently associated with substantial and persistent new cognitive impairment and functional disability among survivors. The magnitude of these new deficits was large, likely resulting in a pivotal downturn in patients' ability to live independently. Hundreds of thousands of patients endure severe sepsis each year in the United States.5 It has been suspected that many are discharged with a new—but poorly defined—constellation of cognitive and functional impairments,6 which may explain their reduced quality of life.7 Even hospitalizations for less severe illness often result in a period of functional disability8 and may hasten the progression of dementia.9,10 Long-term cognitive and functional declines have been shown among survivors of other critical illnesses, but these declines may be partially preventable.11-14 Although severe sepsis is the most common noncardiac cause of critical illness,5,15 the long-term impact of severe sepsis on cognitive and physical functioning is unknown. We studied whether an incident episode of severe sepsis increased the odds of subsequent worsened cognitive impairment and functional disability among survivors. We took advantage of a nationally representative ongoing cohort study of older Americans that included detailed information from personal surveys and Medicare claims. This provided an opportunity to examine the long-term impact of severe sepsis before—and up to 8 years after—incident disease. The Health and Retirement Study (HRS) is an ongoing cohort nationally representative of community-dwelling US residents older than 50 years. Begun in 1992, more than 27 000 individuals have contributed 200 000 hours of data-collection interviews. Every 2 years, the cohort is reinterviewed. The HRS achieved a very high follow-up rate, routinely exceeding 90% to 95% including proxies.16 Furthermore, 16 772 participants have consented for linkage of their study data with Medicare. This work was approved by the University of Michigan Institutional Review Board. Patients provided informed consent on enrollment in the HRS and again for linkage to Medicare claims. We studied all respondents with at least 1 interview during 1998-2004 in which cognitive and physical functioning were assessed and for whom there were subsequent claims-based data on a hospitalization for severe sepsis during 1998-2005 (Figure 1). All patients were followed up through death or the 2006 survey. Our primary analyses focus on hospitalizations that patients survived long enough to participate in at least 1 follow-up interview. Characteristics of the hospitalizations for severe sepsis were abstracted from the Medicare claims, including an organ dysfunction score (the sum of the number of organ failures of cardiovascular, neurologic, hematologic, hepatic, renal, or respiratory origin).5,17 Self-reported race and ethnicity were included only in the descriptive statistics because they may be of interest to some readers. We relied on a claims-based definition of severe sepsis, which has been widely used and clinically validated.5 This definition requires evidence of both an infection and new-onset organ dysfunction during a single hospitalization. If a patient had more than 1 distinct septic hospitalization, each hospitalization was included. As a comparison, we conducted parallel analyses in a cohort of 5574 hospitalizations. These were first hospitalizations for members of the linked Medicare cohort, which included neither severe sepsis nor critical care use and for which a baseline survey and at least 1 follow-up interview were available. At each wave of the survey, we asked respondents if they required assistance with any of 6 activities of daily living (ADLs: walking, dressing, bathing, eating, getting into and out of bed, and toileting) or 5 instrumental ADLs (IADLs: preparing a hot meal, shopping for groceries, making telephone calls, taking medicines, and managing money). We totaled the number of ADLs and IADLs to create a total deficiency score (range, 0 requiring no assistance to 11 requiring assistance for all categories).18 The survey asked proxies to evaluate the functional status of patients who could not answer for themselves; proxies could answer these questions with high reliability.18 For some analyses, a baseline of functioning was defined, using the last survey prior to severe sepsis. It was decided a priori that patients would be divided into 3 groups based on their baseline functioning: no limits, 0; mild to moderate, 1 to 3; and severe limitations, 4 or more deficiencies. The survey assessed cognitive function in 2 ways during biennial personal interviews. For those aged 65 years or older, a 35-point scale was administered that included tests of memory, serial 7 subtractions, naming, and orientation.19,20 For self-respondents younger than 65 years, the survey tool administered a more limited 27-point scale that excluded the orientation measures. For patients 65 years or older who were unable to be interviewed themselves, the validated Informant Questionnaire on Cognitive Decline in the Elderly21 was administered to proxies. For proxies representing respondents younger than 65 years, the following questions were used to determine cognitive function: “How would you rate [the respondent’s] memory at the present time?” and “How would you rate [the respondent] in making judgments and decisions?” The response options for both of these questions were excellent, very good, good, fair, or poor. For analyses of functional status, our primary outcome was measured by a combined ADL and IADL score. For unadjusted analyses, we grouped patients by the number of surveys they had completed since severe sepsis occurrence; for example, we compared all patients at their last survey before hospitalization with severe sepsis with patients at their first survey after severe sepsis. For multivariable models, we used longitudinal models to examine the association between the timing of severe sepsis and the timing of functional changes. These models used only within-person variation over time in functional status to estimate the impact of severe sepsis, and thereby control for all characteristics of the patient that did not change over time— in essence, patients served as their own controls.26 Specifically, we constructed latent growth curve models using a hospitalization-level fixed effect, sometimes called conditional models.26 These results controlled for not only the functional status of the patient before his/her sepsis episode but also for functional trajectory. All of these sequential evaluations were included in the analysis. In these models, time from admission with severe sepsis to survey interview was measured to the day as a continuous variable. Additional information about the statistical approach is presented in the eMethods appendix, including alternative specifications. Fixed effects models were estimated using xtreg, fe in Stata 10.1 (StataCorp LP, College Station, Texas). These analyses were not conducted according to a fully prespecified protocol. For analyses of cognitive functioning, our primary outcome was level of cognitive impairment. Unadjusted analyses were conducted as for functional status. For multivariable analyses, we used conditional logistic regression to analyze the impact of severe sepsis on moderate to severe cognitive impairment among survivors, using clogit in Stata 10.1. As for functional status, these analyses used only within-person variation over time to estimate the effect of severe sepsis, controlling for time-invariant characteristics of the respondent. All analyses were conducted with hospitalization as the unit of analysis unless otherwise indicated. Two-sided significance testing was used throughout, and a P value of .05 was considered statistically significant. There were 1520 identified episodes of severe sepsis among 1194 respondents for the years 1998-2005, from a cohort of 9223 respondents (Figure 1). Detail about the entire population of severe sepsis hospitalizations is presented in eTable 1. Ninety-day mortality after severe sepsis was 41.3% (95% confidence interval [CI], 38.8%-43.8%); 5-year mortality, 81.9% (95% CI, 79.8%-84.0%). Five-year survival curves are presented in the eFigure. Five hundred sixteen individuals survived 623 episodes of severe sepsis and had at least 1 follow-up survey; these hospitalizations by survivors are our primary cohort for analysis (Table 1). Patients were followed up for up to 4 surveys (7.8 years) of data prior to severe sepsis and up to 4 surveys (8.3 years) afterward. Incident severe sepsis was associated with a clinically and statistically significant increase in moderate to severe cognitive impairment among survivors. For example, 6.1% (95% CI, 4.2%-8.0%) of eventual survivors had moderate to severe cognitive impairment at the survey just before severe sepsis, and the prevalence increased to 16.7% (95% CI, 13.8%-19.7%) at the first survey after severe sepsis (Figure 2, P < .001 by χ2 test). In fixed-effects regression, with each patient serving as his/her own control, the incidence of severe sepsis remained highly associated with progression to moderate to severe cognitive impairment (odds ratio [OR], 3.34; 95% CI, 1.53-7.25; Table 2). 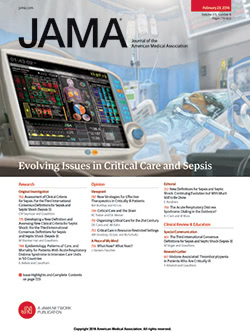 No association existed between severe sepsis and the net prevalence of mild cognitive impairment in adjusted or unadjusted analyses; nearly equal numbers of previously normal patients developed mild cognitive impairment after severe sepsis as patients with presepsis mild cognitive impairment developed postsepsis moderate to severe cognitive. Survivors of hospitalization for severe sepsis were at greater risk of additional functional limitations at their next survey. This was a substantial worsening in their trajectory relative to before their sepsis hospitalization. The negative effects of severe sepsis were greater in those patients with better baseline physical functioning (Figure 3). The new functional deficits were not concentrated in any particular subset of the functioning measures (Figure 4). The independent effects of severe sepsis on long-term disability persisted in multivariable analyses with each patient's presepsis functional trajectory serving as his/her own control. Table 3 shows that severe sepsis was associated with the development of 1.57 (95% CI, 0.99-2.15) new limitations among patients who had none before sepsis. Patients with mild to moderate limitations before sepsis had a similar increase of 1.50 (95% CI, 0.87-2.12) new IADL and ADL limitations. For such patients, not only was sepsis associated with an acute increase in the number of functional limitations, but sepsis also heralded a more rapid rate of developing further limitations thereafter, at 0.51 new limitations per year (P = .007 for difference vs baseline). In contrast, patients with already poor functioning experienced no statistically significant change in functioning with severe sepsis, although the regressions may be limited by ceiling effects in measurement of functioning. Of the hospitalizations involving severe sepsis, 59.3% (95% CI, 55.5%-63.2%) were associated with worsened cognitive or physical function, or both, among survivors at the first postsepsis survey. The association of severe sepsis with increased functional limitations remained clinically meaningful and statistically significant in regression when controlling for changes in level of cognitive impairment after severe sepsis: 1.30 (95% CI, 0.86-1.74) new limitations for those with no limitations at baseline; 1.20, (95% CI, 0.62-1.79) new limitations for those with mild to moderate limitations at baseline. The increased risk of moderate to severe cognitive impairment remained clinically meaningful but was attenuated in the regressions when controlling for contemporaneous changes in levels of physical functioning after severe sepsis (OR, 1.73; 95% CI, 0.83-3.6). We replicated our analyses in several subgroups to examine their robustness. The effects of severe sepsis were similar in the 500 survivors who had severe sepsis but who did not require mechanical ventilation. The regression demonstrated similarly increased odds (OR, 4.0; 95% CI, 1.71-9.31) of developing moderate to severe cognitive impairment after severe sepsis among patients who were not mechanically ventilated. Similarly, in the 205 survivors with no limitations at baseline, severe sepsis without mechanical ventilation was associated with the development of 1.56 new functional limitations (95% CI, 0.91-2.22) in multivariable fixed-effects models. For the 163 patients with mild to moderate limitations, severe sepsis without mechanical ventilation was associated with 1.65 new functional limitations (95% CI, 1.01-2.28). A potential threat to the validity of the results is that patients may have experienced some other cause of cognitive and functional decline between their baseline survey and their sepsis hospitalization. Therefore, we reanalyzed data for the smaller subset of 276 survivors who were never hospitalized between their baseline survey and their severe sepsis admission. We found consistent results, albeit with larger standard errors. In this subpopulation, severe sepsis was associated with increased odds of moderate to severe cognitive impairment (OR, 2.49; 95% CI, 0.99-6.26). In the 128 patients with no functional limitations at baseline and no intercurrent hospitalizations, severe sepsis was associated with the development of 1.46 new functional limitations (95% CI, 0.76-2.15). In the 86 patients with mild to moderate functional limitations at baseline and no intercurrent hospitalizations, severe sepsis was associated with the development of 1.34 new functional limitations (95% CI, 0.34-2.34). Further sensitivity analyses yielded consistent results. The associations between severe sepsis and functional and cognitive impairment were substantively similar in those aged 65 years or older at baseline cognitive assessment and who therefore were assessed using a single instrument before and after severe sepsis (eTable 5 and eTable 6). The patterns observed for functional limitations were similar in a larger cohort of 2043 hospitalizations (including 829 hospitalizations among 684 survivors) for severe sepsis followed up for up to 14 years during the period 1992-2006 (eTable 7). Examining only the subset of 516 first sepsis admissions for each survivor—so that no patient appeared in the analysis more than once—yielded nearly identical results (eTable 8 and eTable 9). In this nationally representative cohort, we have demonstrated for the first time that severe sepsis is independently associated with enduring cognitive and functional limitations. Severe sepsis is independently associated with a tripling in the odds of moderate to severe cognitive impairment. Furthermore, severe sepsis was independently associated with the acquisition of 1.5 new functional limitations in patients with no, mild, or moderate preexisting functional limitations. These new disabilities were substantially larger than those seen after nonsepsis general hospital admissions. Cognitive and functional declines of the magnitude seen after severe sepsis are associated with significant increases in caregiver time, nursing home admission, depression, and mortality.3,27-30 These data argue that the burden of sepsis survivorship is a substantial, underrecognized public health problem with major implications for patients, families, and the health care system. The level of severe cognitive impairment found in these patients has been associated with an additional 40 hours per week of informal care provided by families,3 analogous to an additional full-time job. If causally related, this represents a substantial public health burden of accelerated or de novo brain dysfunction, and one that has received almost no attention, even in the face of the dramatically increasing incidence of severe sepsis.15 In marked contrast to Alzheimer disease and some other forms of dementia, onset and acceleration of cognitive impairment due to sepsis is likely partially preventable in many patients. These benefits might be achieved by raising the standard of care for patients who develop sepsis—both sepsis-specific care as well as other intensive care unit practices such as sedation management and early physical and cognitive rehabilitation—and by avoiding sepsis altogether.34 Improving the prevention and management of sepsis may warrant a place in the broader brain health and disability agendas. We conducted analyses that address several possible limitations. The regressions used only within-person variation to estimate the association with severe sepsis; thus, characteristics of the survivors that did not change over time cannot explain the timing of changes in cognitive and functional status. The different cognitive and physical function outcomes between the survivors of severe sepsis and of the comparison general hospitalizations suggest that the sepsis results were not simply due to the aging of the cohort or the mere fact of hospitalization, processes shared equally by both groups. These different outcomes also suggest that our results cannot be attributed solely to asymmetric censoring, one form of a potential bias known as “truncation by death.”47 However, because patients with worse cognitive and physical functioning have greater mortality (eFigure),22,30 there may be some conservative bias in our results. This form of truncation by death results if patients with the worst cognitive and physical declines after sepsis do not survive long enough for a follow-up survey. To the extent that such truncation by death is present, the full effect of severe sepsis on cognitive and physical functioning would be even greater than we measured. Our study has several limitations. Unlike prior studies that have focused on acute functional decline in the perihospitalization period,1,8,48-50 the present results demonstrate only long-term effects; short-term deficits (eg, less than 6-12 months) are likely greater, with at least some patients recovering some function prior to their next HRS biennial survey. The neuropsychological battery that we used provided an assessment of global cognitive function, but did not allow detailed study of individual cognitive domains nor did it establish a definitive clinical diagnosis of dementia. Importantly, we used cognitive categories and cutoff scores that have shown good correlation with clinical dementia51 and expected outcomes of dementia3,27 in prior studies. We used a claims-based definition of severe sepsis. Although this is not the same as prospective clinical assessment, it is the same approach used in recent landmark epidemiological studies.5,15 Our data were restricted to fee-for-service Medicare patients aged 65 years or older.5 We have shown that these deteriorations were temporally associated with severe sepsis and independent of other stable patient characteristics, but we have not conclusively proven that it was severe sepsis rather than other simultaneous events that led to these declines. Although, to our knowledge, this is the largest study to date of severe sepsis and our outcomes of interest, our study was not powered to examine interactions, such as the extent to which the changes after sepsis varied with the number of organ failures or type of inciting organism. Medicare claims lack the information necessary to disentangle whether particular acute interventions are associated with differing long-term outcomes. Finally, we demonstrated the association of severe sepsis with functioning under the treatment regimes in effect in a range of US hospitals at a particular point in time. New treatments for sepsis, or changes in life support or other hospital practices, may modify the long-term cognitive and functional effects of severe sepsis, even if these deficits are not an explicit target of care. In summary, in this large nationally representative cohort of older adults, we found that the odds of acquiring moderate to severe cognitive impairment were 3.3 times as high following an episode of sepsis, with an additional mean increase of 1.5 new functional limitations per person among those with no or mild to moderate preexisting functional limitations. Thus, sepsis is often a sentinel event in the lives of older patients, initiating major and enduring cognitive and functional declines with lasting implications for patients' independence, for their loved ones, and for the societal institutions charged with supporting them. Future research to identify mechanisms leading from sepsis to cognitive impairment and functional disability—and interventions to prevent or slow these accelerated declines—is especially important now given the aging of the population. Corresponding Author: Theodore J. Iwashyna, MD, PhD, Pulmonary and Critical Care Medicine, 3A23 300 NIB, SPC 5419, 300 N Ingalls, Ann Arbor, MI 48109-5419 (tiwashyn@umich.edu). Author Contributions: Dr Iwashyna had full access to all of the data in the study and takes responsibility for the integrity of the data and the accuracy of the data analysis. Study concept and design: Iwashyna, Ely, Langa. Analysis and interpretation of data: Iwashyna, Ely, Smith, Langa. Drafting of the manuscript: Iwashyna, Ely, Langa. Critical revision of the manuscript for important intellectual content: Iwashyna, Ely, Smith, Langa. Statistical analysis: Iwashyna, Ely, Smith, Langa. Administrative, technical, or material support: Iwashyna, Ely, Langa. Study supervision: Iwashyna, Ely, Langa. Funding/Support: This work was supported by grants K08 HL091249, R01 AG027010, and R01 AG030155 from the National Institutes of Health; the Society of Critical Care Medicine's 2010 Vision Grant; and by pilot support from grant UL1RR024986 from the Michigan Institute for Clinical and Health Research. Grant U01 AG09740 from the National Institute on Aging provided funding for the Health and Retirement Study, which is performed at the Institute for Social Research, University of Michigan. Dr Ely was supported by grant AG027472 from the National Institutes of Health, by the Veterans Affairs Merit Award, and by the Tennessee Valley Geriatric Research, Education and Clinical Center. Consultative support was provided by the Measurement Core of the Michigan Diabetes Center through grant P60 DK-20572 from the National Institute of Diabetes and Digestive and Kidney Disease. Role of the Sponsor: The funders played no role in the design, interpretation, or decision to publish the analysis presented herein. Additional Contributions: We thank Mohamed Kabeto, MS, Ryan McCammon, AB, Lili Deng, MD, MA, and Tish Shapiro, MA, all at the University of Michigan, for their expert programming; they were financially compensated for their work. We further thank Robert Hyzy, MD, and Rodney Hayward, MD, of the University of Michigan for insightful critiques; they received no compensation for their work.